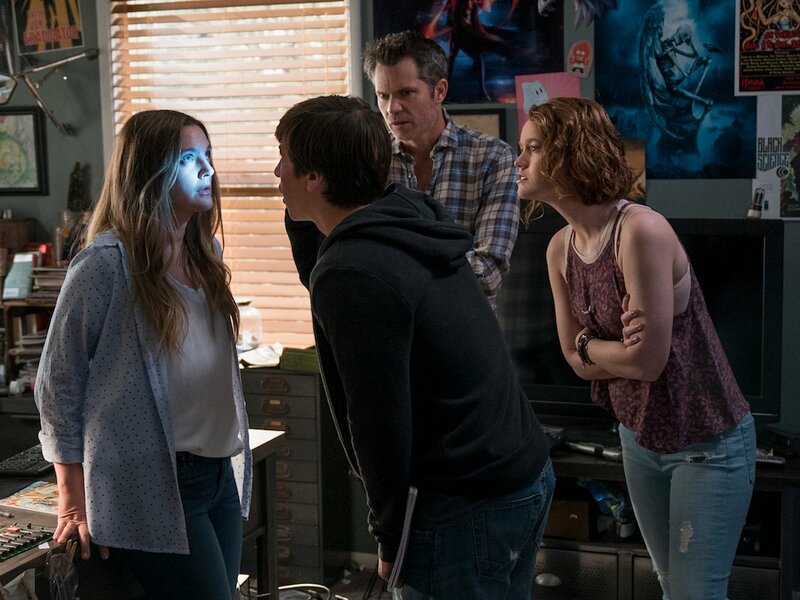 Home / Reviews / Santa Clarita Diet: I know we have to kill somebody today, but we have to be parents every day. I’ve always loved a good sitcom. And while the traditional set-up of the genre allows for plenty of scope for great comedy, I am thoroughly enjoying the inversion of tropes and exploration of variations on the structure that modern television seems to be embracing. Santa Clarita Diet is a great example of this. It takes the idea of a suburban sitcom and parodies the clichés while leaning into them at the same time. The series follows the Hammond family. Sheila and Joel, high school sweethearts, are now successful realtors with the ‘perfect’ suburban life. We don’t see much of this ordinary life before things take a turn towards the unbelievably disgusting (it really is A LOT of vomit). Sheila develops a curious affliction, a case of urban zombie-ism, as diagnosed by the teenage geek next door. While Sheila relishes her newfound energy and carefree nature, Joel struggles to find a way to keep his family together in enforced normalcy. And when Sheila discovers she can’t go on without a diet of human flesh, the two put their marriage to the ultimate test: can a couple who murder together, stay together? There’s no denying this show is great fun. While it is endearing from the off, it does take a few episodes to find its groove. 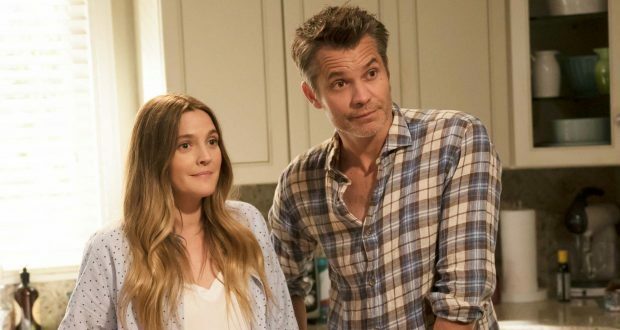 Drew Barrymore finds herself in familiar territory in the screwball comedy, but Timothy Olyphant struggles to hit the right notes for a few episodes. At first, he appears terrified to have found himself in the role, like an escaped patient from a psych ward with an insane grin and dead eyes. Thankfully, he does significantly improve as the show continues. The strongest performances in the main cast come from the teenagers. Sheila and Joel’s daughter Abby, played by Liv Henson, is consistently strong from start to finish in her role grounding the narrative. Through all the bizarre occurrences, Abby behaves in the most realistic and familiar way. She begins rebelling against the rules of ‘normal’ life as she realizes that nothing really matters if your mother can suddenly become a zombie. And who could blame her? The problem with having Abby’s storyline be so familiar to the audiences is that it becomes too familiar in its clichés and obvious outcomes. 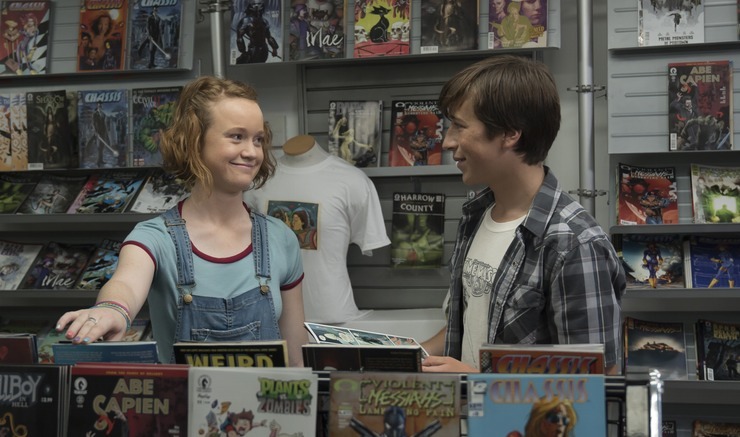 Thankfully, the pining boy next door (played by Skyler Gisondo) also delivers a fantastic performance to make up for any potentially dull moments. Santa Clarita Diet is exactly the kind of show that works on Netflix. 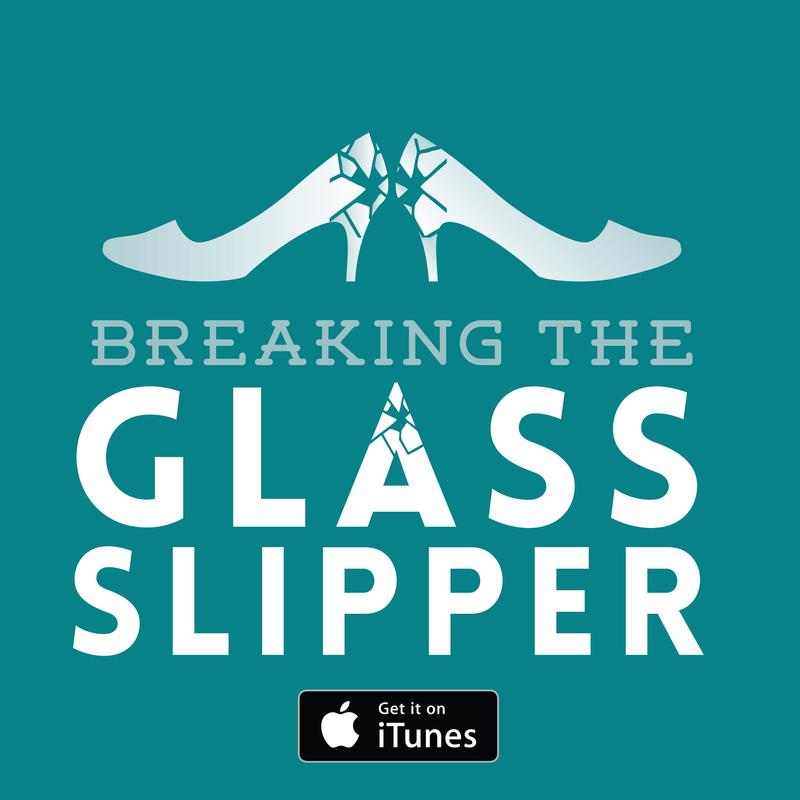 Short and sweet, funny and endearing, it’s highly consumable and rewards binge watching. While its screwball nature keeps the audience guessing, we ultimately know that everything will work out. After all, it’s a sitcom. Everything imaginable can – and does – go wrong, but the Hammonds will pull it back. They will stick together and live to fight another day as human man and zombie wife. Like many of these fun premises, I am unsure about its potential staying power. Where will the show go from here? 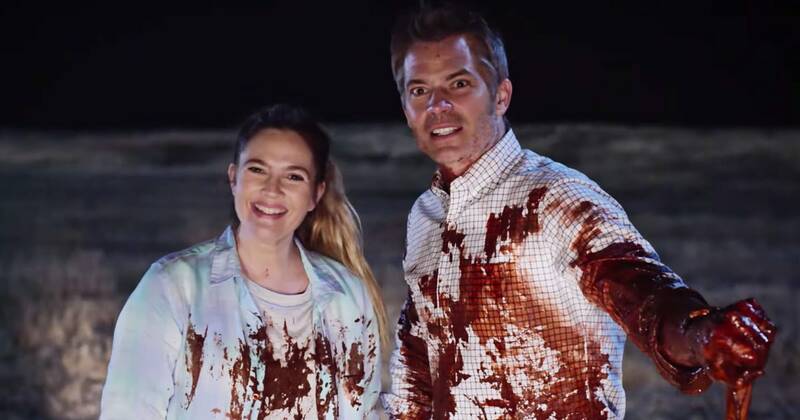 Unlike a traditional sitcom, Santa Clarita Diet doesn’t necessarily reset to the status quo at the end of every episode (or at least not entirely). The tension and threat does increase as the show goes on – as it necessarily would. After all, if you’re going to run about town murdering people, even if you do try to find the equivalent of ‘young, single Hitler’ as your victims, being caught feels inevitable. With this escalating tension and the inevitability of some storylines, I wonder how the writers could keep the carefree and fun comedic tone to the show. Netflix’s new original sitcom was never going to be a show that redefined a genre or a critical darling with real staying power, but it is great fun. This is the kind of show that you can switch off your brain for. Verdict: Enjoyable parody of the perfect suburban life with dark humour and gore. Gilmore Girls: A Year in the Life Nostalgic Impulse: That 70’s Show The total irrelevance of Matthew Perry’s The Odd Couple Gimmicks and sitcoms: A sustainable set-up?